Journalists have the freedom of expression, thanks to democracy. Democracy protects them and gives them the keys to produce quality information for their audience. In some countries, whistle blowers are protected by the law and journalists have access to official and financial documents… It helps them a lot to do well their job. 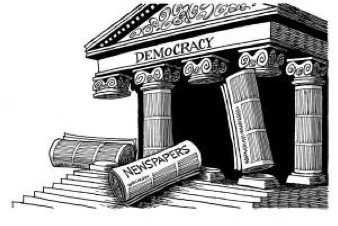 I think that journalists can be considered as a tool for democracy. Indeed, if you study briefly the derivation of the word “democracy”, you find that - Demos à people – Kratosàpower. Democracy gives power to the people and gives them the freedom of expression. Journalists should use this freedom of expression to protect people’s power. Today, they have access to the mass media, to inform people. More than the newspapers, the TV, there are Internet, Facebook, Twitter, the web sites. It gives the opportunity to communicate on a global scale. But because their audience is so huge, they have so many ways to communicate, and that the democracy protects them, they have to be careful. That is why they have a code of ethic to follow. Every country has its code of ethics, but basically, we can find the same principles in all of them. A journalist must be accountable and transparent, act independently, minimise harm and seek truth and report it. The code of ethics shows that in a certain way, journalists are also supposed to protect the democracy, as it supports them. Citizens have the same right to the freedom of expression as the journalists. They have the same access to the mass media, but they do not have to follow a code of ethics. Because of that, it is easier for them, for the citizen-journalists, to publish fake news, for example. As it is written in another article, what is published on the media takes part in the education of people. It means that they can bias the education of people, if they publish fake news. It is a big issue for the future, and it points the fact that there is a lack in the law, for this new category of citizen-journalists. What future for the citizen-journalists? It is not reasonable to imagine that people could continue to publish fake news. As the journalists, they are protected by the democracy, they enjoy the freedom of expression, but some of them abuse it. To fight against that, it could be possible to create a code of ethics for the citizens. But it would have to be different from the code of ethics of the journalists, because citizens do not have the same rights and responsibilities. This difference is not the only barrier. Indeed, journalists have to follow their code of ethics because they are professional. But add a code of ethics for the citizens? I could be considered as an attack against their rights, and by extension against democracy. Below, a video done by a journalism school.